The Korean tech and electronics giant signaled demand for its OLED panels will remain healthy this quarter. It also forecast memory conditions will improve by Q2 2019. Samsung's outlook was relatively encouraging, given all the negative news out there. Samsung's (SSNLF phone business continues to bleed share, its sales of other consumer electronics also aren't looking great and its flash memory business is in the midst of a brutal downturn. However, with the help of iPhone-related orders, Samsung's display panel business appears to be in good shape. And if the company's forecast for its memory business proves accurate, the downturn that's currently hitting flash memory and to a lesser extent DRAM makers could end sooner than some have feared. On Tuesday night, Samsung reported Q3 revenue of 65.46 trillion won (up 5% annually and equal to $57.3 billion) and an operating profit of 17.57 trillion won (up 21% and equal to $15.4 billion). 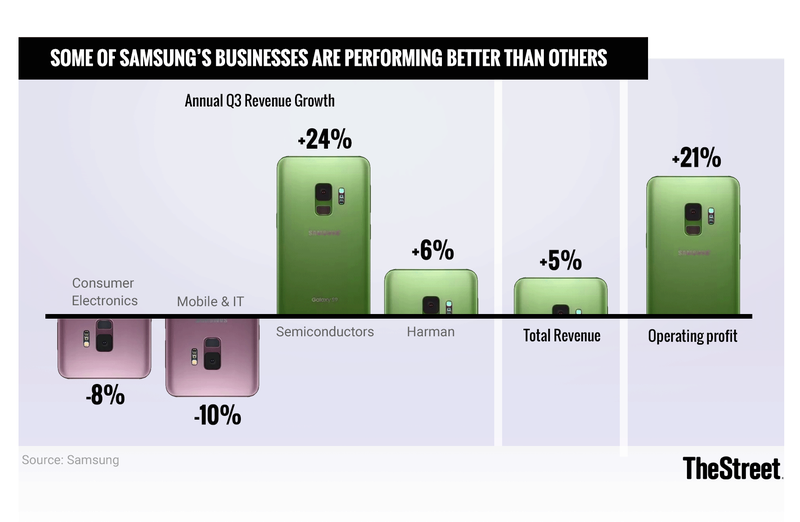 These figures are near the high ends of the Q3 guidance ranges Samsung provided in its Oct. 4th pre-announcement. Results were hurt by a 12% drop in mobile hardware sales -- the recent Galaxy Note 9 launch did only so much to lessen the impact of stiff competition from Apple (AAPL - Get Report) and Chinese Android OEMs, as well as an 8% sales drop for the company's Consumer Electronics division. However, as indicated below, some other businesses fared better. Samsung's shares closed nearly unchanged in Seoul following the news. However, OLED materials and intellectual property provider Universal Display (OLED - Get Report) , whose sales depend heavily on Samsung, rose about 14% in U.S. trading ahead of its Thursday afternoon Q3 report. And memory rivals Micron (MU - Get Report) and Western Digital (WDC - Get Report) , whose shares have had a rough October (Western especially), are up over 5% and 4%, respectively, amid a 2% gain for the Nasdaq. In addition, though the broader tech rally is clearly helping here, it's worth noting that Apple is up over 3% ahead of its Thursday afternoon report. Samsung reported that its display panel business, which received about 80% of its sales from OLED panels, saw revenue rise 22% annually to 10.09 trillion won ($8.8 billion). The fact that Apple began shipping this year's OLED iPhone models (the iPhone XS and XS Max) about six weeks earlier in the year compared to when it began shipping the iPhone X last year presumably gave a boost. Nonetheless, though this year's iPhone-related shipments appear to be more weighed to Q3, Samsung expects its OLED business to see "stable demand from major customers" in Q4. That outlook is one more encouraging sign about 2018 iPhone XS demand, and seems to be going over well with Universal Display investors. With the help of strong server and mobile demand, Samsung's memory chip sales rose 29% to 21.05 trillion won ($18.4 billion) in Q3. Heavy cloud capital spending, the iPhone XS ramp and increases in DRAM and flash content for high-volume smartphones provided a lift. However, Samsung also reported that its NAND flash average selling price (ASP) fell by a mid-teens percentage sequentially. It also gave no indication that price declines will ease in Q4, as an expected 40%-plus 2018 increase in NAND industry bit shipments yields a supply/demand imbalance. Western Digital is just a week removed from offering a rough December quarter outlook that was partly blamed on NAND weakness. Much as Micron reported for its August quarter, Samsung says its DRAM ASP was flat sequentially in Q3. The company did caution, however, that DRAM prices might soften in the near-term due to "supply shortage issues of a major component" -- that's an apparent reference to Intel's (INTC - Get Report) PC CPU shortages -- and (echoing Micron) "short-term inventory [adjustments] for some customers." At the same time, Samsung insisted DRAM industry fundamentals remain solid thanks to server, mobile and PC demand drivers, and reiterated a prior forecast for 2018 DRAM industry bit shipments to rise a moderate 20%. Micron, for its part, has forecast 2018 bit growth will be "slightly above" 20%, and that 2019 growth will be around 20%. Notably, while talking about its memory business overall, Samsung forecast supply and demand will once more be in balance by Q2 2019, thanks to healthy server and mobile demand. Regarding server demand, Samsung forecast that "new CPU platform launches" will provide a boost. That's an apparent reference to Intel's upcoming Cascade Lake Xeon server CPU launches; the chips are expected to start shipping this quarter ahead of a 2019 ramp. AMD (AMD - Get Report) , whose server CPU share is a lot lower than Intel's, could be ramping its second-gen Epyc CPUs (codenamed Rome) around the same time. Samsung also signaled that NAND price declines are boosting consumption in both the solid-state drive (SSD) and mobile flash memory markets. And like Micron, it stated that the cost declines enabled by newer DRAM and NAND manufacturing processes are boosting margins. And in line with commentary from chip equipment makers such as Lam Research (LRCX - Get Report) , Samsung signaled it's now being more cautious with its memory capital investments. When asked about 2019 DRAM capex, the company noted it might convert some NAND production lines to DRAM next year, rather than build brand-new DRAM lines. It's possible that Samsung's forecast for a Q2 stabilization proves too optimistic -- especially if trade tensions linger and end up hurting end-market demand. For NAND in particular, there's a risk that high bit supply growth prevents prices from stabilizing until the second half of 2019, when new smartphone launches should provide a boost. Nonetheless, considering how negative commentary about the memory industry has become, and how low valuations have gotten, Samsung's outlook has to be considered relatively encouraging.